This is a female Carolina mantis, Stagmomantis carolina. It is one of quite a few different species of insect called "praying mantis." Carolina mantises come in green, brown, and combinations of both. Click to enlarge. The females of this species are easy to identify because their wings only cover three-quaters of the abdomen, like a hip-length jacket. 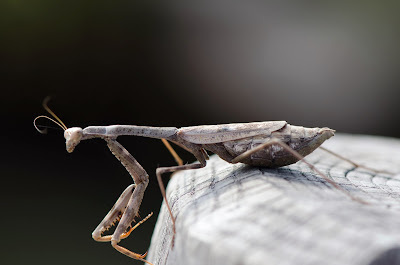 I just saw four of these mantises in the space of two days -- all females. Was that a coincidence or are they up to something? P.S. The brown one was photographed on a fencepost near the pond in Brooklyn Bridge Park. That's a bit north of their traditional range. But it is not unusual for them to get around on plants and by boat, car, truck, train, and other accidental transport. People also introduce them to gardens as egg cases from garden supply stores. 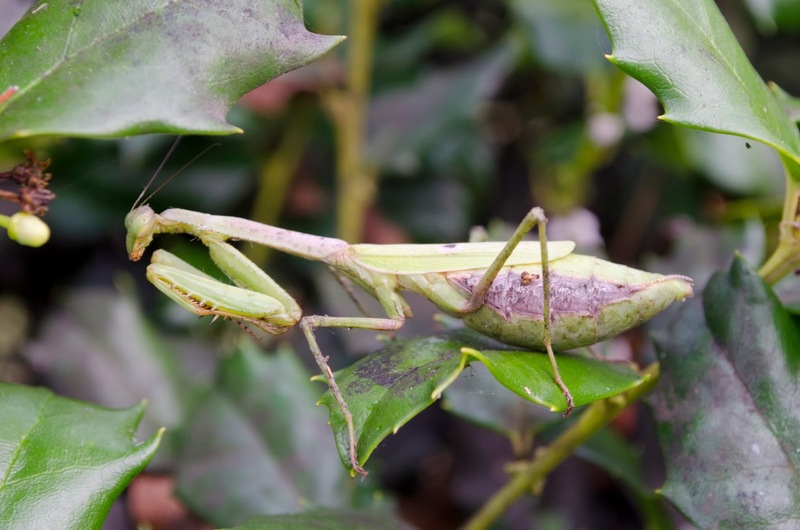 Mantises are beneficial insects that prey on insect pests. Happy to see they have found our park! This is so fantastic! Have you seen the asian mantises as well recently? They are fabulous, aren't they? I always feel lucky to see one. Have not seen anything but Carolinas lately, but I am on the look out for more!